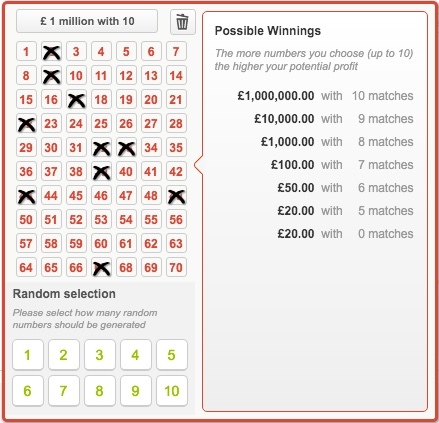 You can win up to £1 million betting on this unique lottery draw that takes place every 4 minutes, from 5.34am until 10.54pm UK time every day of the week. You can also win even if you don’t match any numbers! You can see all the prize tiers in the tables below. KeNow works just like any other lottery — you pick the numbers you think will be drawn and win a prize if you guess them correctly. The amount of money that you win is determined by the amount of numbers that you correctly guess. The only difference to a usual lottery is that a KeNow draw takes place every four minutes. In each draw, 20 numbers are drawn from a total of 70. 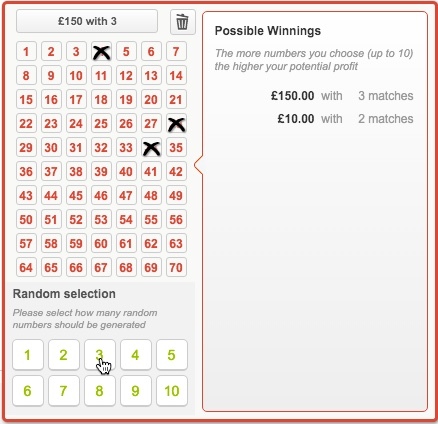 In any single bet, players can choose anywhere between a single number and 10 numbers. The more numbers the player chooses and matches the higher the possible winnings. How does betting on KeNow at Lottoland work? Instead of entering the official KeNow draw, you place a bet on the outcome and the results of it can be found here. You pick the numbers you think will be drawn in the same way as if you had entered the official lottery draw. Select from 1 to a maximum of 10 numbers you wish to bet on from a pool of 1-70 for each line bet. You can use the QuickPick feature to automatically choose 10 numbers you want to bet on. 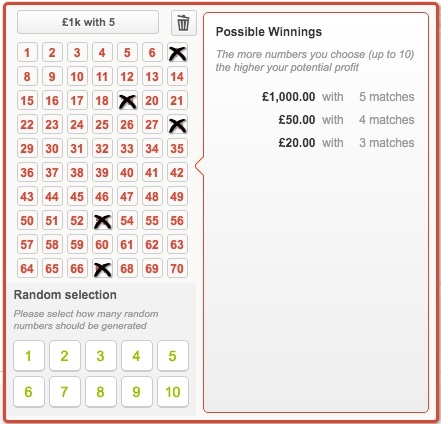 Another choice is to use the Random Selection feature within the betslip which will randomly select a given amount of numbers for you from 1-10. You then need to choose how much you want to stake for each bet. You can choose a single stake for £1, or multiply it. The more you stake the more you win for each prize tier. You can multiply a stake up to 10 times the amount and each stake amount costs £1 extra. The maximum prize also increases with each stake increase. For example, a stake value of x1 on a line bet with 10 numbers costs £1 and allows you to win a maximum of £100k. 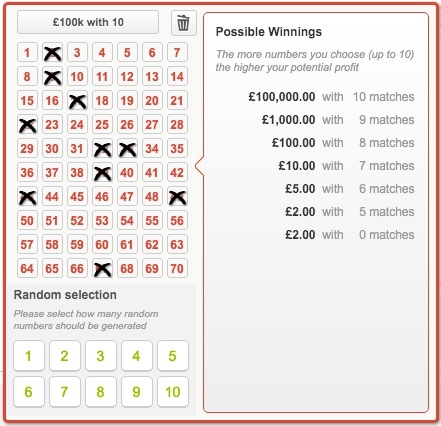 A stake value of x2 with 10 numbers costs £2, for which you can win a maximum of £200k, and so on up to a maximum of x10, which costs £10 and allows you to go for the maximum £1,000,000 top prize. What ever the amount of numbers you choose will constitute a single line. How does the prize change with the amount of numbers you choose for each bet? The following example illustrates how this works using the example of choosing 10 numbers versus choosing 5 numbers. The cheapest possible line bet is £1 for a single stake and the most expensive is £10 for a multiple stake of x10. Each stake increase costs £1. The amount of numbers you choose and the stake value determines the price for a line bet. How do I win the maximum prize of £1 million? You need to match 10 of the 20 winning numbers and select a stake value of x10. 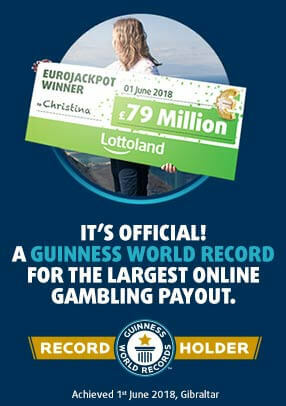 What are the odds of winning the £1 million top prize? The odds of winning the top prize on this game are 1 in 2,147,181. The tables below explains the different prize tiers, odds of winning and returns with a stake value of x1 and a stake value of x10 for a standard QuickPick line bet with 10 numbers. The draw takes place every 4 minutes from 5.34am until 10.54pm GMT every day of the week. Why should I bet on KeNow at Lottoland? With new draws taking place every 4 minutes you can take the chance to become a millionaire betting on KeNow whenever you want. KeNow is also a very flexible draw, allowing you to stake anything from £1 up to £10 on a single line bet. Furthermore, the prize tier amounts are fixed, so you know exactly how much you can win.